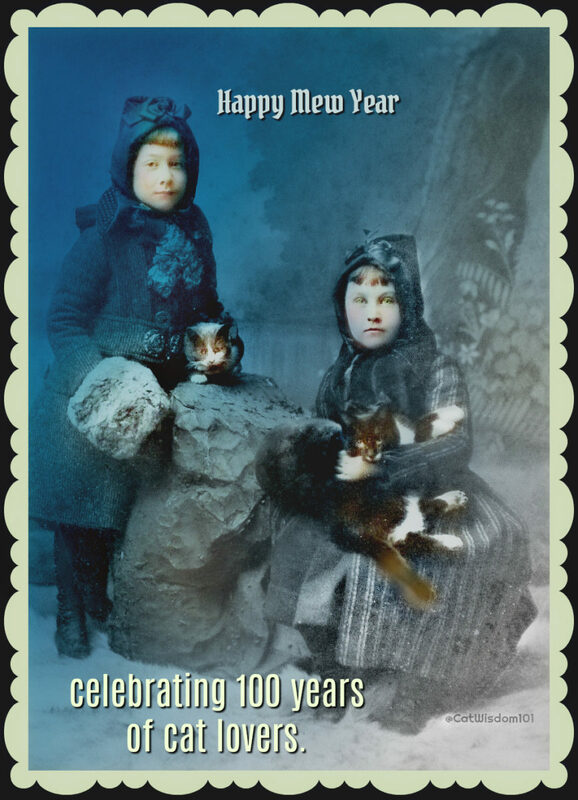 100 Years of New Year’s Eve Cheer With Cats by Layla Morgan Wilde. Happy New Year or New Year 2018. It was a rough year of ups and downs but 2017 will always be a special year since it’s the year we published our first book Black Cats Tell All: True Tales And Inspiring Images. We’re happy to say farewell to 2017 and ready to welcome a fresh new year and yes, a new book! Before we say hello or goodbye, thanks for being here. 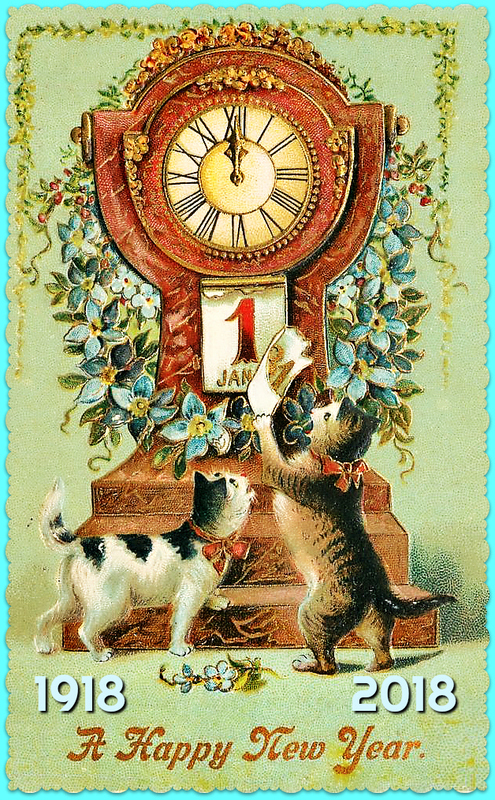 May the new year bring you an abundance of purrs. We hope this odd assortment of new year’s greetings old and our new creations bring cheer. This very royal black cat actually dates back to 1896! 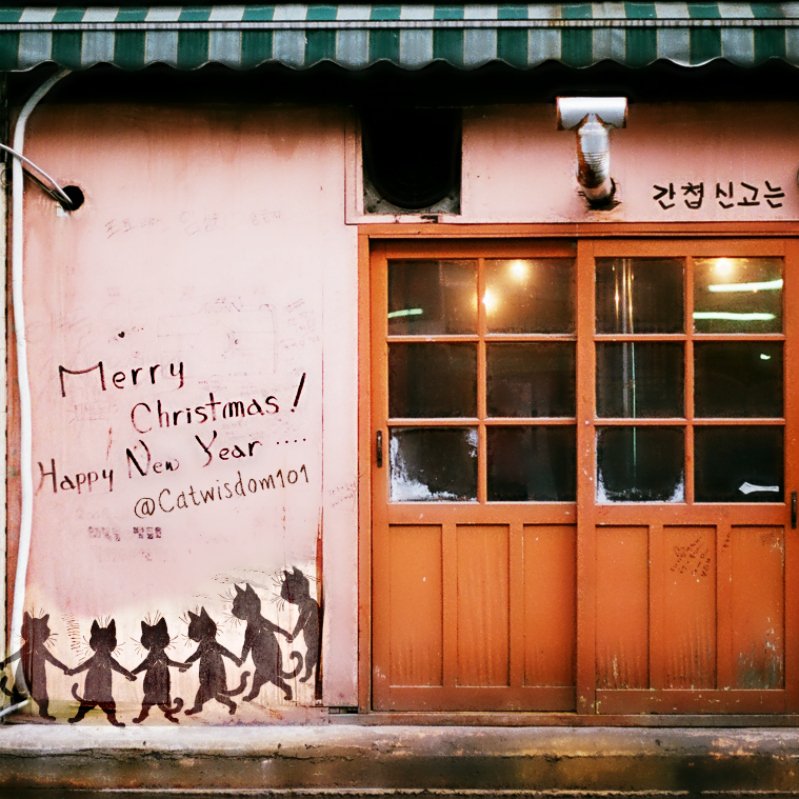 We come across cat graffiti everywhere. 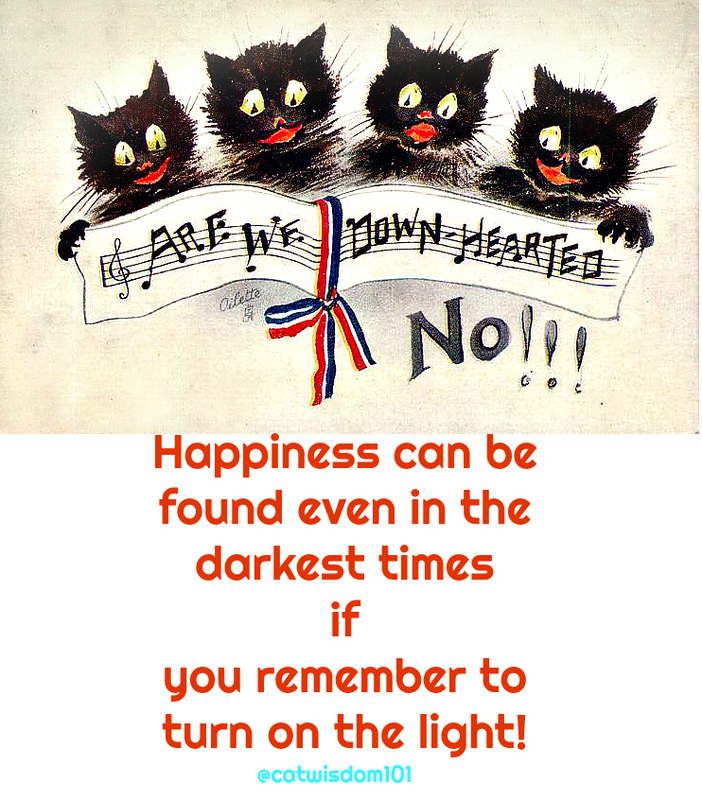 Some World War I cheer from black cats with a dash of the 21st century. And no matter what language you speak, black cats bring good luck. Bonne Annee to our our French speaking friends. 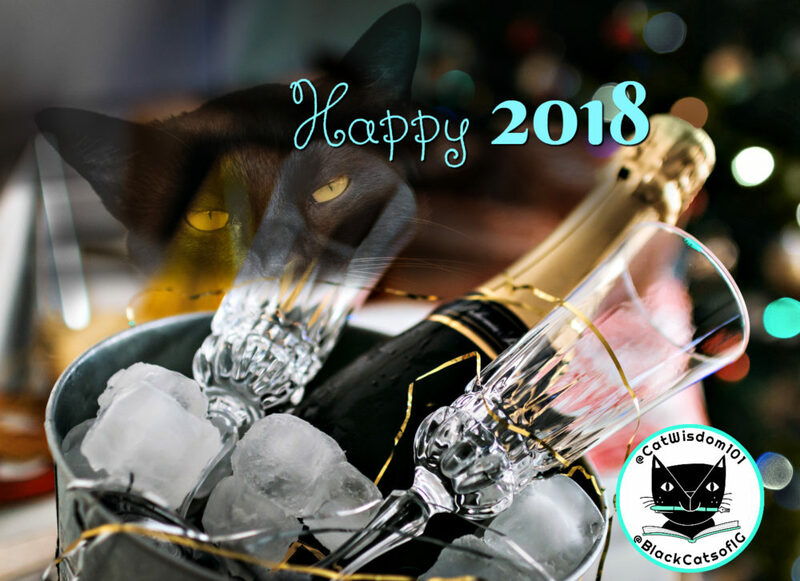 We drink a toast to you but please keep all alcohol away from cats. It’s toxic but you know that from our regular dispensing of cat wisdom. Not only are we celebrating a New Year but it’s a super full moon. Let’s hope your cats aren’t going wild like these kitties. How about you? How are you celebrating? 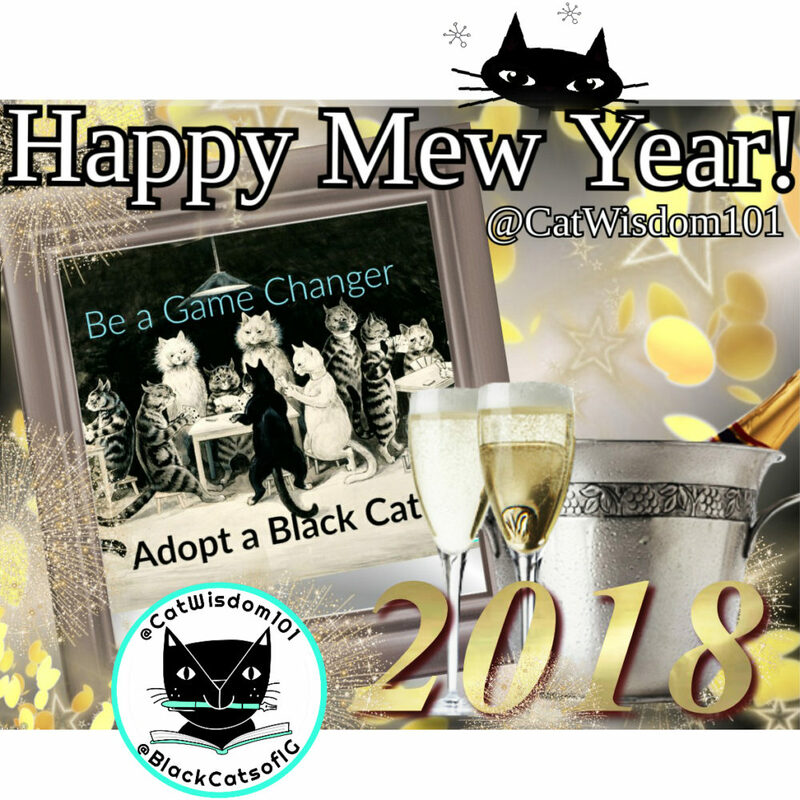 We are celebrating making a difference in the lives of black cats and will continue to advocate for all less adoptable shelter cats. What? 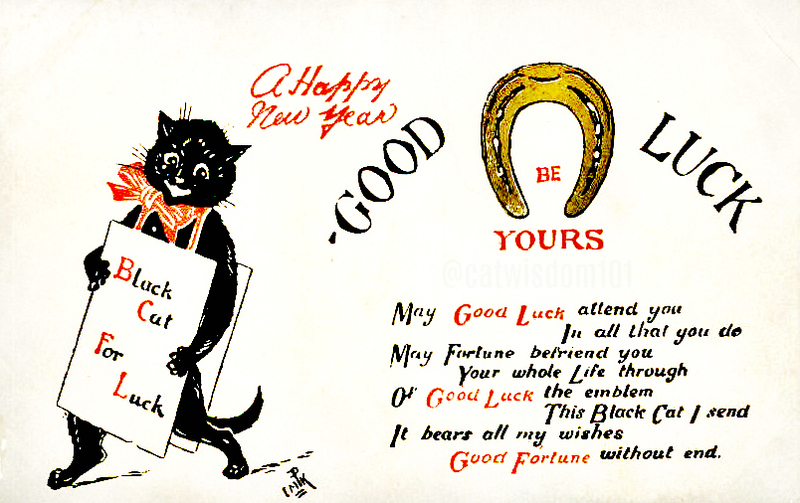 You’d like to see more feline vintage NEW YEAR luck and wishes? Click and visit our New Year’s post from last year plus explain the real meaning behind Auld Lang Syne. 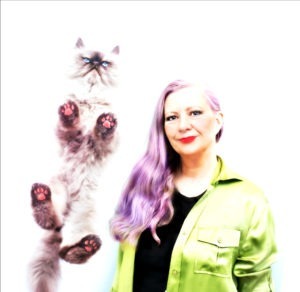 Thank you for all the lovely stories posts and more We all love our kitties and celebrate Happy Meoooow Year 2019! 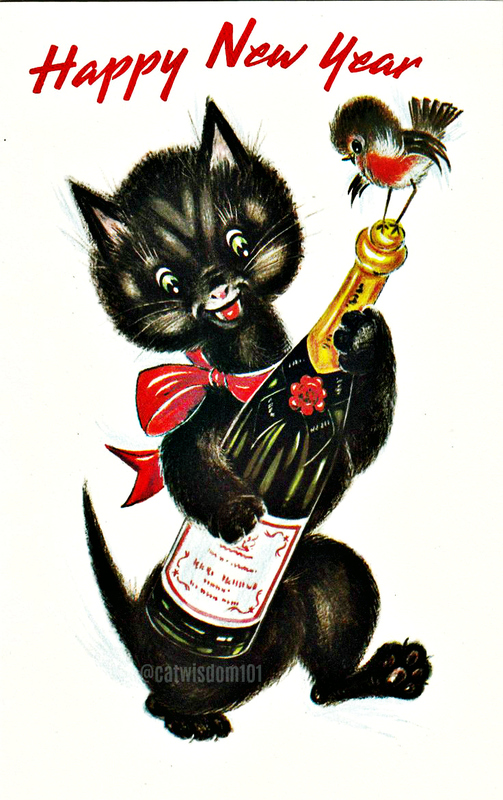 Rather belatedly we here at Meezer’s Mews and Terrieristical Woofs wish you a very Happy New Year! We hope 2018 brings you joy, happiness and success in all that you do! I love old cards–especially post cards and greeting cards. This is a great selection! Thanks for sharing! Our pleasure and happy you stopped by! Happy New Year, Layla and fur family. Kisses to our friend Clyde! May this year bring health, energy for new adventures, and time with sweet friends, old and new. Thanks Maggie and Clyde sends a special kiss xox Yes, to good health and energy! 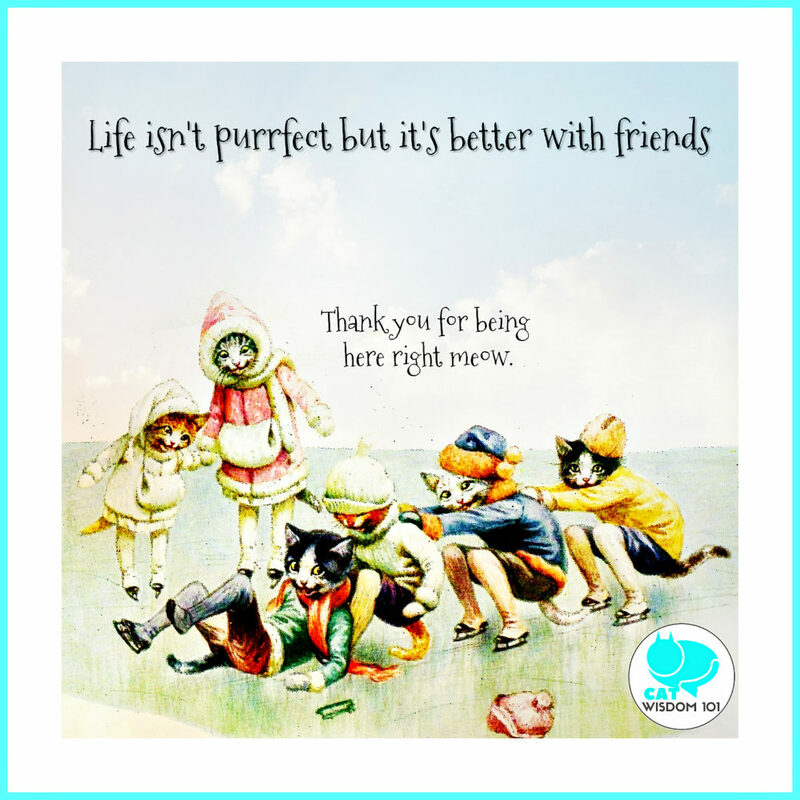 Luvs and purrs and the bestest fishes ever to each and all. We hope the New Year brings tons of positive changes for animals of every kind all over the world!!! We will make this a wonderful world! Sending love xox and will call soon. would love to hear your soothing voice! Happy Happy Mew Year! Wishing you a wonderful 2018! So glad you stopped by. Are you feeling the busy 5 year already? Let’s catch up soon! 2018 will be great! Happy New Year and wishing you a bright and prosperous 2018. Warm wishes from a frozen Montreal! 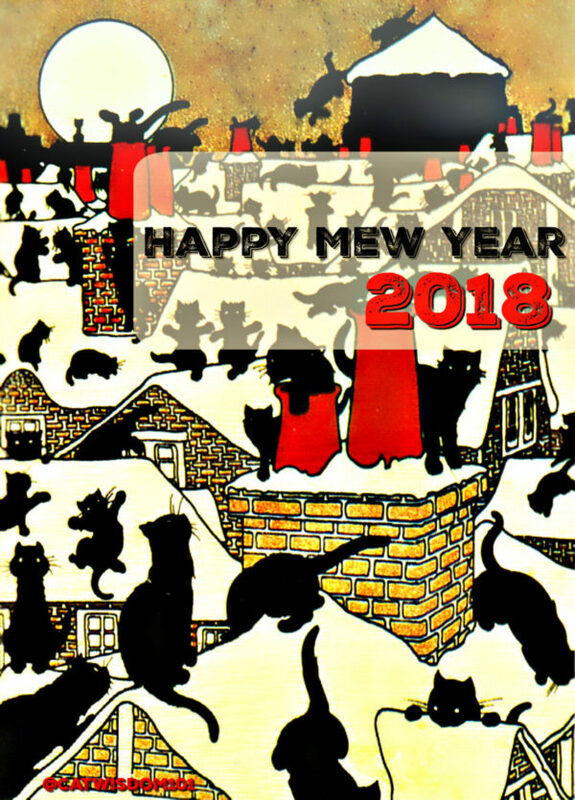 Happy Mew Year – happy to hear such wonderful projects on the horizon! Warm wishes and purrs for a great year from the Zee/Zoey gang! Deb, sending purrs and we have much catching up to do! Layla we hope that you ALL have the best year EVER in every single way…….2017 is a year we shall all not be TOOO sad to wave bye-bye to…..but even a bad year brings lessons and learning so it wasn’t all bad. Much success in 2018 and always. Happy New Year to you, dear friends. We are so grateful for you! 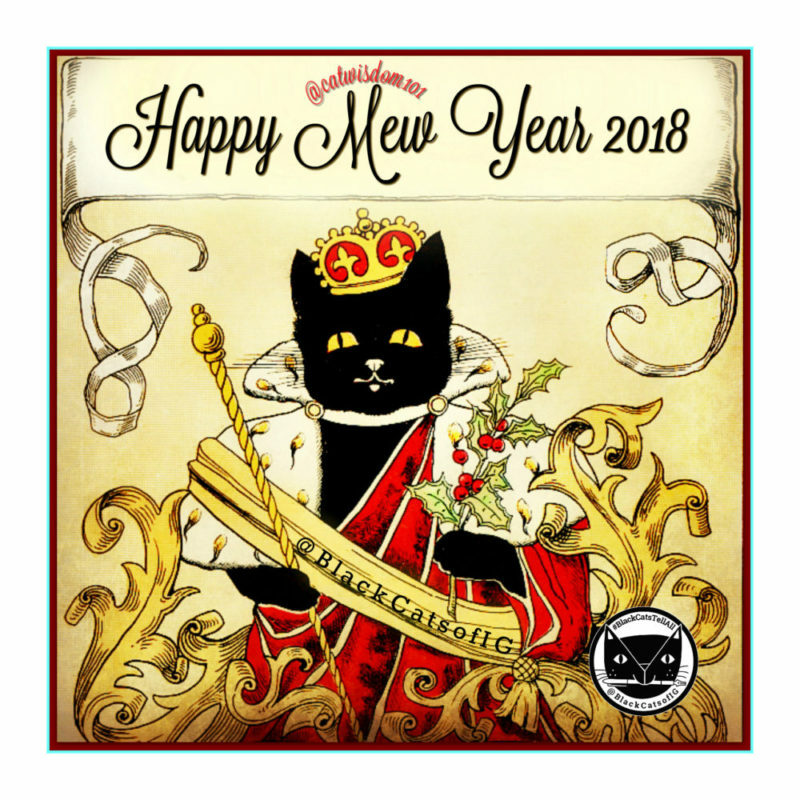 Happy Mew Year, Layla – hope it’s the best ever!! Wishing you much happiness in the New Year! Who is in Atlanta with Kristina. Happy New Year to you! Lovely cards, all of them. Happy MEW Year!!! Have a great and prosperous year ahead.